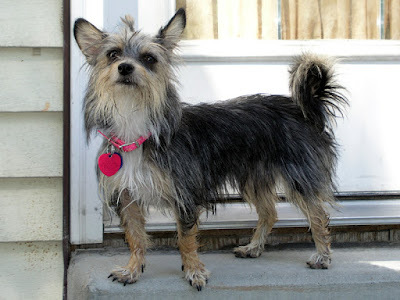 As has become customary, Lexie is a Silky Terrier and Cairn Terrier mix. Lexie is most definitely Marilee's dog, though she has an obvious like for me, too. In fact, she slept next to my head Saturday night. Likely since Bambi slept attached to Marilee's side all night. We've had conflicts of course - Lexie hasn't yet had to deal (much) with Sundance, though Lexie being so aerodynamic, can hurdle the baby gate into Sundance's loft. And at one point Saturday morning, Sundance jumped over and past Lexie. Bambi is having the most trouble with Lexie, since Bambi had been getting major lovin's from Marilee since Snickers left the fold. Princess, not so much. Within moments of Lexie coming home last Wednesday, Princess got a major snort of Lexie and that was that. Lexie is about a year and a half old, needs to put on a little weight, and is a perfect match for the family.